Will my child calm down if I introduce him to meditation? Yes, and No. Many times parents think of meditation as a way to help children to calm down. Particularly when they are feeling energetic. This does not work as a quick-fix for helping children calm down. The first thing to understand is that children become boisterous because they have more energy and not enough constructive ways to express it. Meditation is not a way to express energy. It is a relaxation. Just as the body wants to relax when it is tired, the mind too wants to relax after it has been exerted. So the excess energy that a child has can be channeled into creative pursuits such as dance art, making mandalas or any hobby that the child is passionate about, this will dissipate the energy. Once the energy has dissipated, the child will want to relax, this is the right moment to teach meditation. Over time (long time), meditation helps children remain calm. It does not mean that the child will have less energy. It just means that their self-awareness and as a consequence, their capacity to govern themselves through high energy moments will be enhanced. 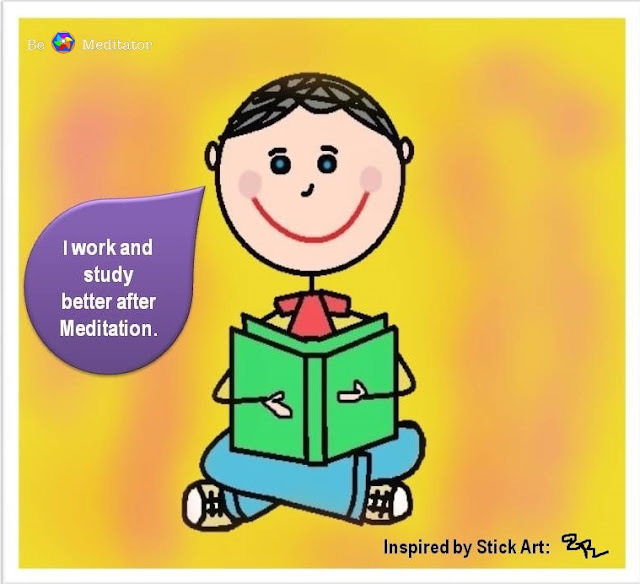 Even still meditation is not a replacement for physical exercise or mental exertion.